Walmart India is an Economic Predator uses Child Slavery, Paid off politicians, sweatshops and predatory pricing. 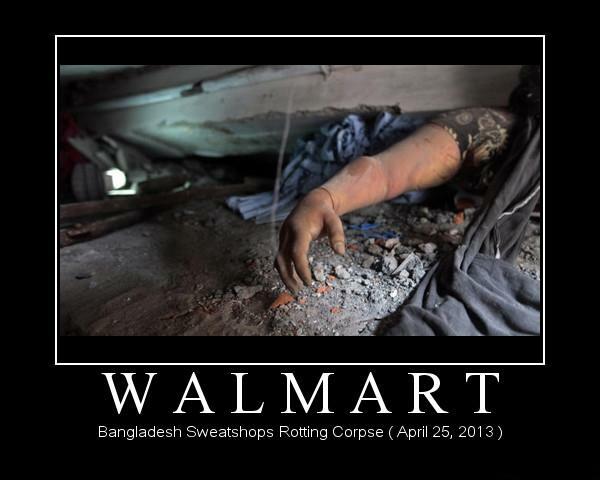 Walmart as well as a number of brand names like Canada’s Joe Fresh, Western world, the Gap have outsourced their manufacturing in countries like Bangladesh where the minimum wage standards are as low as $25 a month. Women are specifically chosen as factory slaves because they can be paid much less than men. The labor costs in this country is the lowest because of years of manipulation done by the corporations like Wal-mart, that haggles its way down to the lowest value for its profiteering agendas. They point out that the consumers want the lowest prices, but in reality, the Corporations are making every effort to cut corners in every area so that their margins never go down. The areas where they truly cut corners are mostly the human costs. It is the common man that burns for the profiteering agendas of such money grubbing corporation. There have been deaths constantly in this country, and the Government as well as the factory owners are blamed when they had been pushed into a corner by the corporations themselves to give them the lowest rates. They use psychological warfare to manipulate the minds of the masses, and they can easily control the government officials by paying them off under the table using their traditional lobbying – Bribing tactics. People have been dying in Bangladesh for many months now, continuously. In November 2012, there was a factory fire, then again in Jan 2013 – there was another factory disaster. Again in April 2013, a factory collapsed where over 300 people were found dead, and there are more bodies being recovered from the rubble. The death toll keeps rising, and the corporations enjoy their Billions over deaths of hundreds of people that they do not even consider human. People are the commodity in these times, and the monstrous people behind such corporations have the time of their lives over deaths of others. I will never shop at Walmart.